"It went the way it had to, it went the way it was going to. Just like this." Really, The Walking Dead? Andrew Lincoln said that the first two episodes of the second half of Season 5 would be brutal, and he clearly wasn't kidding. Spoilers ahead if you haven't seen tonight's mid-season premiere of The Walking Dead, "What Happened and What's Going On." With Bob and Beth meeting their demise in the first half of the season, we might have hoped for a break from the tragedy. After all, how much can these characters take? How much can the viewers take? Following the most recent death to a member of Rick's group, tonight's episode saw the grand exit of Tyreese, who spent much of the episode suffering a bite wound. Amputation came too late, and Tyreese succumbed to his injuries, but not before facing off against himself one last time. The episode had Rick, Michonne, Glenn and Tyreese escorting Noah somewhere outside Richmond in search of his mother and brothers. Their efforts were less about finding a new place to live as they were honoring Beth's wishes to see Noah home. The walled community was barely standing when they arrived, and Noah's family was among the deceased. Tyreese got bitten in the arm when he and Noah were searching the house. Tyreese has had a rough time of it, internally. This is not to say that most -- if not all -- of the characters haven't been battling their own personal demons in a world overrun with them. They have. But we've seen signs of Tyreese's struggles for seasons, as he's faced his fair share of hardships, including losing Karen, and the Micah & Lizzie situation, and Carol's eventual confession about killing Karen. These tragedies have taken a toll on his spirit, and in recent episodes, he's seemed determined to maintain his identity and not allow the loss to turn him into something else. When we consider Beth's brush with suicide back in Season 2, and Tyreese's own willingness to walk face-first toward death when he battled that cluster of walkers way-back-when, it's kind of eerie that the two characters would die in back-to-back episodes. Both Beth and Tyreese were sensitive souls, heavily affected by the things they'd been through. Let's step back and take a look at the episode, though, because "What Happened and What's Going On" wasn't simply the episode where Tyreese died. There seemed to be an emphasis on a couple of things, hope and hopelessness being one of them (as a set.) Of course, that's a recurring theme of this series, and in the aftermath of Beth's death, it seems fitting that they would revisit that. In the case of tonight's episode, a big part of that came with Michonne's idea to go to Washington, which seems like less of a set plan as it is a chosen path. Because they need a reason to move forward. They have to have somewhere to go, otherwise all that's left are body parts and more tragedy. Fate seems to be the other theme of this episode, as multiple characters, Tyreese included, pondered what might have been and what mattered. He almost let himself be killed by walkers once, but he fought through them and he ended up being alive to save Judith last season. There are plenty of choices and what-ifs that each character could have made. If Tyreese had killed Martin like he said he did, maybe Gareth wouldn't have found his way to Rick and his group. Maybe Bob would still be alive. Maybe a lot of things. One thing is certain after tonight's episode. It really is over for Tyreese, and he seemed to be ok with that in the end, as he finally decided he'd had enough of the news. He'd paid his bill. 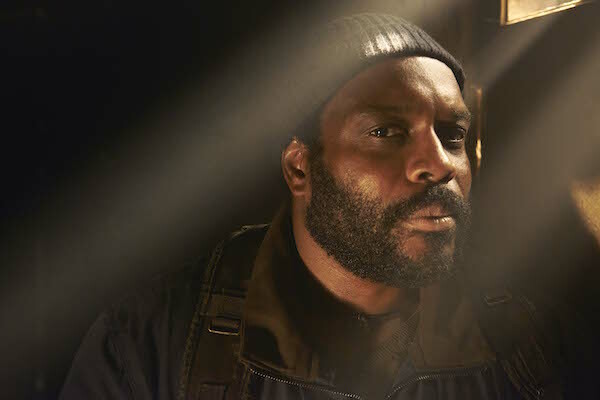 Prior to his death, Tyreese spent much of the episode in a room, bleeding out from the bite wound in his arm as he stared into the faces of some of the fallen characters, including Martin, Beth, Micah, Lizzie and the Governor. That included one more song from Beth, which was a nice addition coming off of the last episode. From the Governor's "Pay the bill" lines, I'm inclined to wonder if maybe Tyreese saw some of his father in that man. Or maybe it's more that his determination to "earn his keep" with the Governor came from his upbringing. It seems likeliest that each character featured in Tyreese's feverish hallucination represented some part of his inner struggle to do the right thing and make the right choices. To fight against the hopelessness and grief and come out of it as best he could. Rick, Michonne and Glenn tried to save Tyreese by chopping his arm off. And for a few minutes, it seemed like maybe he'd pull through. They got him out of there and into the car. They were barely able to get out of that nightmare alive, hitting one last spurt of horror in the form of a truck full of zombie busts. (Seriously what was going on at that place? What was with all the legs and limbs?). They made it out of there, but Tyreese didn't survive. RIP Tyreese. You were tough, you cared and you fought hard. Your struggle is over. As for everyone else, it's just getting worse. How is the group going to deal with Tyreese's death? Sasha will likely be devastated, and the rest of the group will surely feel the loss as well, especially on top of Beth's recent death. It's a good thing Michonne has given them a new plan, as moving forward may be the only option they have.